This dish is a quintessential Sephardic family recipe that uses flavors and ingredients which can be found in many Sephardi (Jews whose origins are from Spain or Portugal) kitchens. 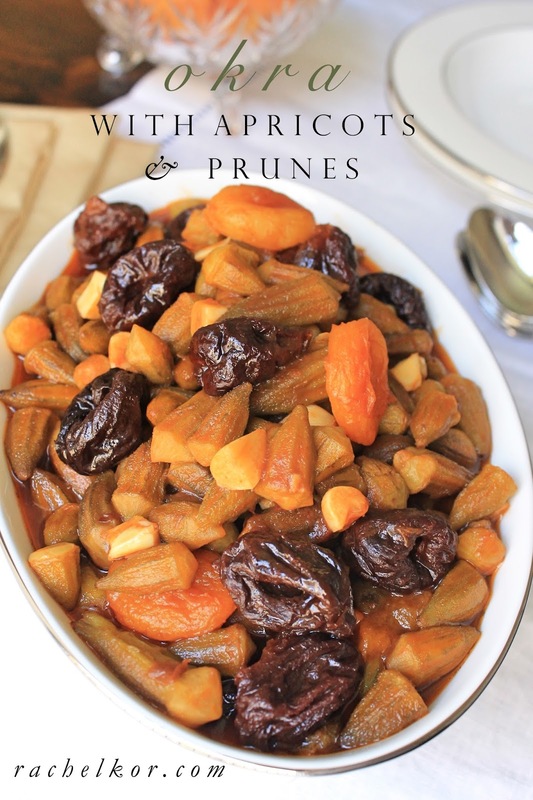 Having a Sephardic father and Sephardic relatives on his side of my family, I have been privileged enough to grow up surrounded by flavors and delicacies from the Sephardic community and have grown accustomed to delicious dishes like Okra with Prunes and Apricots in Tamarind Sauce. To this day, I am still amazed by all the rich and distinct recipes there are, and the endless amounts of ways you can turn a special ingredient into something even more tantalizing and beloved. A big reason for that is because we use many different ingredients in a variety of ways, like the apricots in this dish. We use dried fruit in everything from stews to homemade candy and pastries. Another ingredient used in this dish, is tamarind paste. For those of you who are unfamiliar with tamarind paste, it is made from a tamarind plant and derives a distinct tangy yet fruity flavor. It is essential in Sephardic cooking and can be found in most Middle Eastern markets. Although I have cooked with tamarind paste countless of times, it still remains a very special ingredient to me. I use it for special family gatherings during the year and on holidays. My family loves making this Okra with Prunes and Apricots in Tamarind Sauce on Rosh Hashanah because it has a fruity flavor from the tamarind, a sweet bite from the plump dried fruit, and a beautiful presentation. Doesn’t it just glisten?! I strongly encourage everyone to make this dish. It is rich with fruity flavor and is savory from the garlic and tomato. It doesn’t take long to make, and is sure to please the foodies in your life. You can also add in allspice, cinnamon, or both to this dish! I have made many different versions in the past. In a large saucepan, over medium heat, heat the oil. Add in the okra, and stir for a few minutes, until soft. Mix in the garlic and cook for a few more minutes, until fragrant. Stir in the the tomato paste and tamarindo to coat the okra. Add the water, lemon juice, sugar, salt and pepper. Turn flame down to low, cover and cook for 25-35 minutes. Stir in the apricots and prunes and cook for another 25-35 minutes. I like to serve this dish over a bed of basmati rice so all of the delicious tamarind tomato sauce gets soaked up.